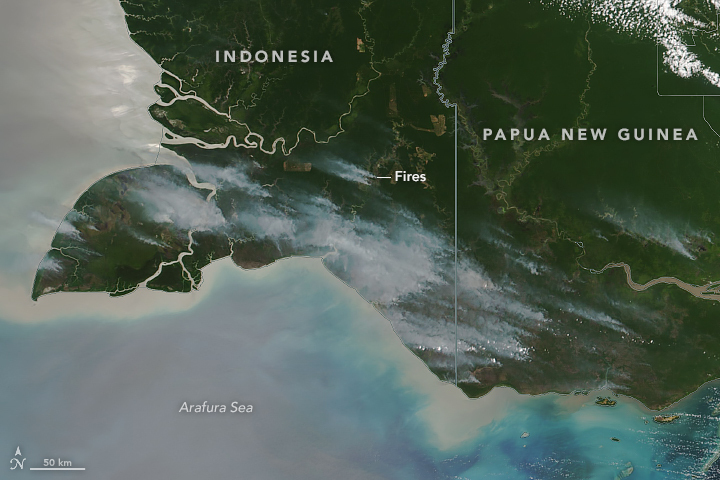 In October 2018, a large number of fires dotted southern New Guinea, shrouding the island in smoke. The Visible Infrared Imaging Radiometer Suite (VIIRS) instrument on the Suomi NPP satellite acquired the natural-color image of the island on October 8, 2018. The Moderate Resolution Imaging Spectroradiometer (MODIS) on NASA’s Terra satellite acquired the natural-color image below on October 26. 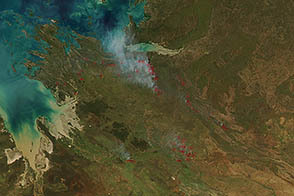 Much of the fire activity occurred in early October, although many fires are still actively burning. 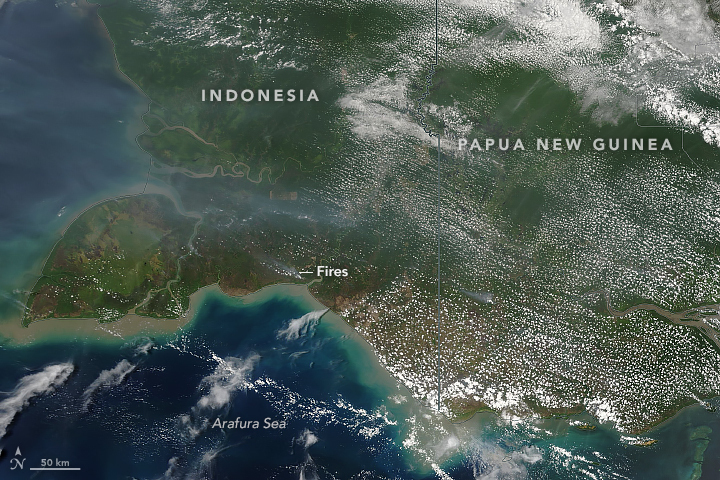 As of October 25, 2018, the Global Fire Emissions Database reported more than 5,000 fire counts detected by MODIS for this coastal portion of Papua New Guinea and Indonesia (pictured), which is noticeably higher than the average number of fires in October in this region over the past 15 years. The only two Octobers with more fires were 2014 and 2015. Much of New Guinea is covered by humid tropical savannas, and fires consume a considerable fraction of this landscape each year. Most of the fires are set by people to clear the land for agriculture, including both smallholder farming and larger palm oil plantations. 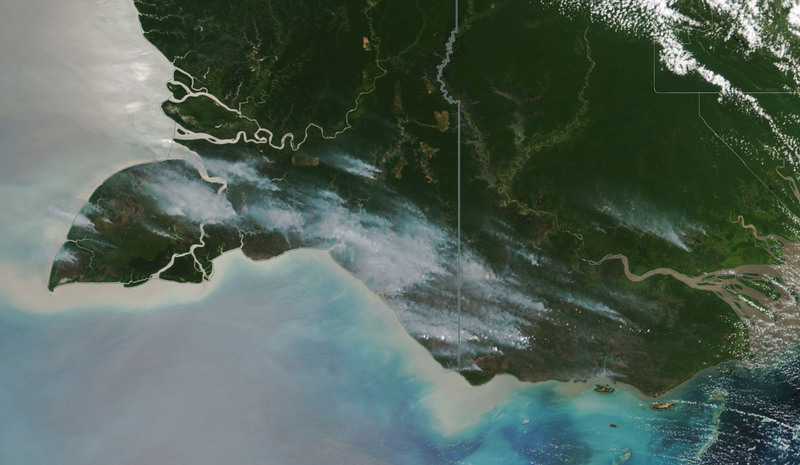 Expansion of palm oil plantations may explain some of the increased fire activity since 2014, said Doug Morton, a wildfire and forest researcher at NASA’s Goddard Space Flight Center. 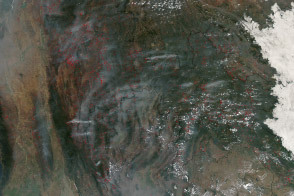 The fires in 2015, however, were also associated with a powerful El Niño event that increased fire activity across Southeast Asia. Similar conditions could be brewing for 2018. “Sea surface temperatures near the end of 2018 indicate that we may close the year with a very modest or weak El Niño, which may cause somewhat dryer conditions than usual in the region,” said Niels Andela, a forest researcher at NASA Goddard. The duration and intensity of fire activity in this region is mainly dependent on the strength of dry season. 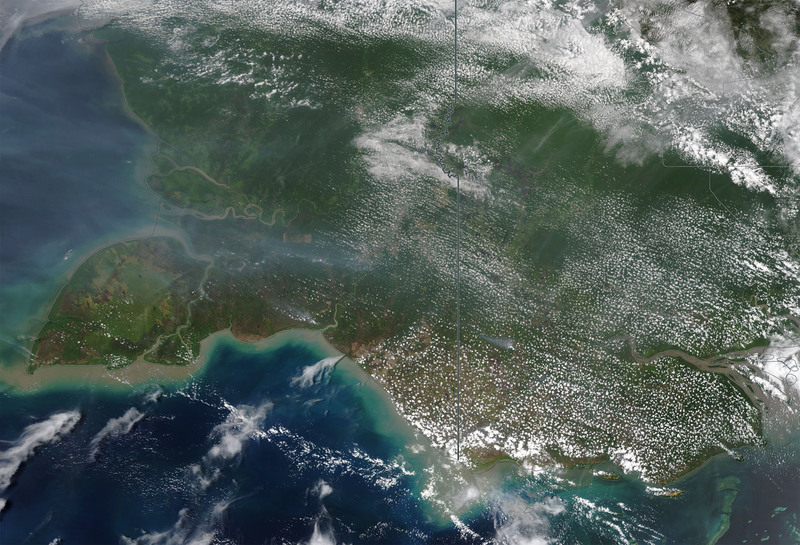 During El Niño years, rainfall patterns shift, leaving Indonesia and surrounding areas in drier conditions that can intensify burning. October 2018 brought an increase in fire detections, which might be associated with a weak El Niño.